What are the different types of surgical cosmetic procedures? What are the different types of nonsurgical cosmetic procedures? Trying to fight the effects of aging? Below is a basic guide to the risks involved in both surgical and non-surgical cosmetic procedures. For more information on each procedure, click on the highlighted links of the procedure. Breast Augmentation: Breasts are enlarged by placing an implant behind each breast. Breast Lift - Extra skin is removed from the breast to raise and reshape breast. Breast Reduction - Fat, tissue, and skin is removed from breast. Eyelid Surgery: Extra fat, skin, and muscle in the upper and/or lower eyelid is removed to correct "droopy" eyelids. Facelift: Extra fat is removed, muscles are tightened, and skin is rewrapped around the face and neck to improve sagging facial skin, jowls, and loose neck skin. Forehead Lift: Extra skin and muscles that cause wrinkles are removed, eyebrows are lifted, and forehead skin is tightened. Lip Augmentation: Material is injected or implanted into the lips to create fuller lips and reduce wrinkles around the mouth. Liposuction: Excess fat from a targeted area is removed with a vacuum to shape the body. Nose Surgery: Nose is reshaped by resculpting the bone and cartilage in the nose. Tummy Tuck: Extra fat and skin in the abdomen is removed, and muscles are tightened to flatten tummy. Botox Injection: Botox is injected into a facial muscle to paralyze it, so lines don't form when a person frowns or squints. Collagen/fat Injection: Collagen from a cow or fat from your thigh or abdomen is injected into facial wrinkles, pits, or scars. Dermabrasion: A small, spinning wheel or brush with a roughened surface removes the upper layers of facial skin. A new layer of skin appears during healing, giving the face a smoother appearance. Used to treat facial scars, heavy wrinkles, and problems like rosacea. Hyaluronic acid injection: This gel is injected into your face to smooth lines, wrinkles, and scars on the skin. Laser hair removal: Laser light is passed over the skin to remove hair. 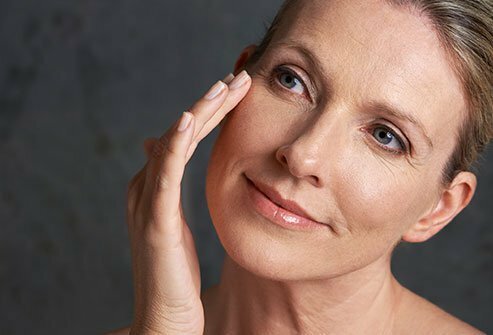 Laser skin resurfacing: Laser light is used to remove wrinkles, lines, age spots, scars, moles, tattoos, and warts from the surface of the skin. Sclerotherapy: A solution is injected into spider and varicose leg veins (small purple and red blood vessels) to remove the veins. Chemical Peel: A solution is put onto the face (or parts of the face) that causes the skin to blister and peel off. It is replaced with new skin. Have you had a surgical cosmetic procedure? Are you satisfied with the results? Please share your experience. Have you undergone non-surgical cosmetic procedures? Were you satisfied with the results? Please describe your experience. Birthmarks can appear on the head, over the eye, or anywhere on the skin. To learn more about birthmarks explore this medical image gallery. Get information about birthmark pigmentation, color changes and health risks of birthmarks. A dog bites about 4.5 million people each year, and about 27,000 will need surgery. Dog bites often become infected, and will need medical treatment and management. Make sure that the dog’s rabies vaccination is current; if not, rabies treatment may be necessary. A dog bite may cause symptoms and signs like puncture wounds, lacerations, pain, swelling, and redness. Treatment and management of a dog bite in and infant, child, teen, or adult depends upon the severity of the wound. Dog bites can be prevented by not approaching stray or unfamiliar dogs, especially if the dog is eating, sleeping, or caring for puppies; always ask the dog owner if you can pet the dog, and do not make eye contact, run, or scream if a dog if you are confronted with a dog. An atypical mole whose appearance is different from that of a common ordinary mole. See a picture of Dysplastic Nevus and learn more about the health topic. Moles are small skin growths that may appear flat or raised and are often tan, brown, black, reddish brown, or skin colored. They are typically about the size of a pencil eraser. There are three types of moles. Monthly skin self-exams are essential in the early detection of abnormal moles and melanomas. Urethral cancer is a rare form of cancer that primarily affects white females, people over 60 years of age, and those who have stds or who experience frequent urinary tract infections. Symptoms and signs of urethral cancer include blood in the urine, interrupted urine flow and discharge from the urethra. Treatment involves surgery, radiation therapy, and chemotherapy.